The AMD Radeon RX Vega GPU was trumpeted as a serious challenger to the dominance displayed by Nvidia's range of premium GeForce cards. RX Vega did come in, eventually, released in reference form during August. One would have expected partner models to arrive on shelves very shortly afterwards, differentiated on cooling, design, and performance, but this did not happen. 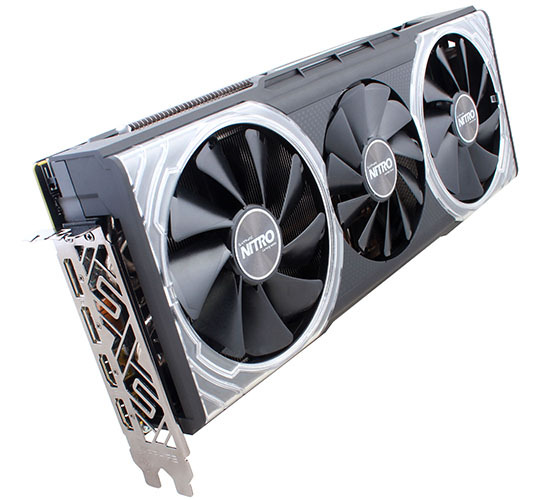 In fact, even four months after launch, the only models of RX Vega that you can buy are based on reference air- and water-cooling designs from AMD. Why? That is a question with many possible answers, and the one that appears to fit best is that AMD has been slow to release Asics and board designs to customers such as Sapphire and Asus. AMD has missed a serious monetisation opportunity in the run-up to the holiday season, but as the adage goes, it's better late than never. And so we move on to the card in for review today. AMD stalwart Sapphire has been busy readying a custom model based on the RX Vega 64 for some time now, and here is the fruit of its labours. This behemoth is the Nitro+ Edition. Sapphire has gone back to the drawing board with this model, in a good way, to rectify the two main problems with the reference design: heat and noise. 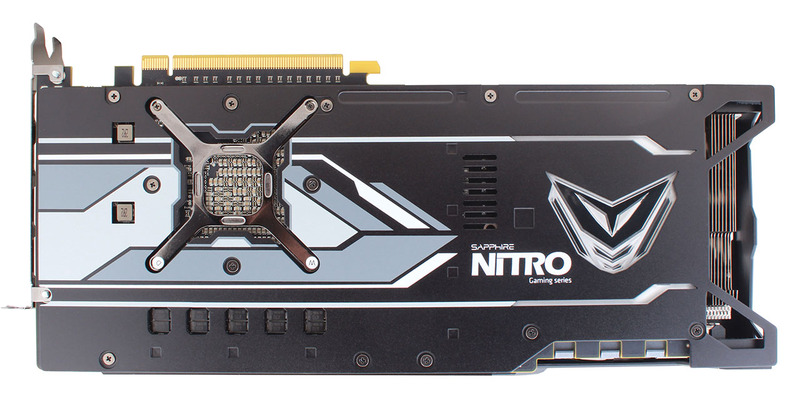 AMD's most potent GPU to date needs some serious cooling to tame these two clear problems. 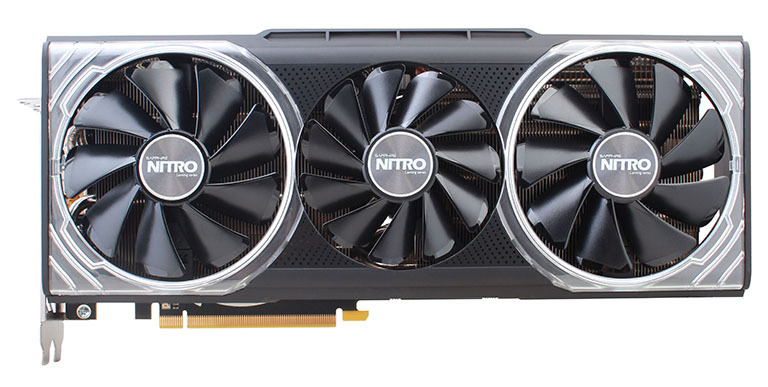 Sapphire's coolers have historically been able to sort out GPUs with TDPs in excess of 250W with the minimum of fuss, but it's been a fair while since the company ran with a three-fan design - almost two years, in fact, when the R9 Fury Nitro came to market. This cooler is different to that, however, as it has more in common with the nascent 500-series Nitro range, evidenced by the look and feel. Pertinently, the two outer fans are identical, measuring 95mm across and, at default, ringed with classy blue LED lighting, which can be changed to any colour you want through an updated version of Sapphire's TriXX Glow utility. The lighting extends to the Sapphire logo on the back and Sapphire name on the side of the shroud, which is invisible otherwise. Should fancy lights not be your thing, they can be switched off altogether. The middle spinner is clearly smaller, at 80mm, and like the surrounding fans, it can be removed for easy cleaning, or simple replacement if it fails. The fans remain off until temperate exceeds 55°C or so, thus following the Intelligent Fan Control trend of late. Interestingly, it spins in the opposite direction to the two outer fans, presumably for better performance. Be sure to have plenty of space in the chassis, too, as the card measures 310mm from tip to toe and weighs in at a whopping 1,604g. It's taller than normal and takes up the best part of three slots, so do bear this in mind if you are thinking about doubling up and going CrossFire. Sapphire is of the opinion that the relatively sedate cooling of the reference model is certainly not the way to go, and we would agree. Such is the bulk that a reinforcing bracket is supplied in the package. Underneath, Sapphire uses two large heatsinks that cover the expanse of the PCB, and each is connected to a metal plate that makes contact with the GPU, memory and VRMs. The double-stacked heatsinks are connected to each other via an array of heatpipes - five in total - and everything is very securely held in place. Some graphics cards feel flimsy; this one could cause some serious damage. Drilling down further, removing the fan assembly shows how Sapphire has gone about its business. 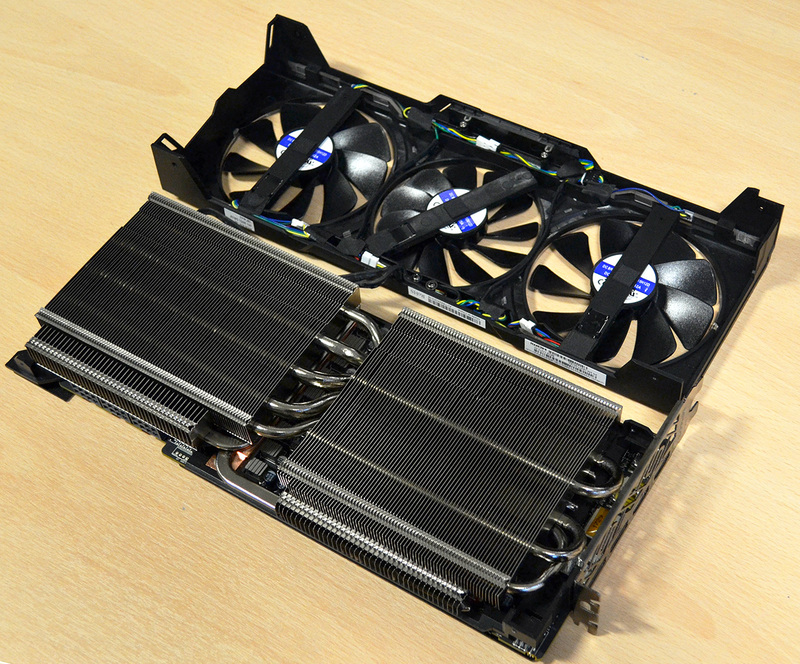 The main heatsink covers the GPU and associated HBM2 memory and sits on top of both via a frame. Sapphire then connects it to the hottest components through copper heatsinks. A single flattened heatpipe snakes it way into the middle and covers the VRMs, again touching them via a copper heatsink. All told, there are 14 power phases at work, which should bode well for overclocking. The other heatsink is, as we know, connected to the main one by five heatpipes - three thick and two thin. The whole design smacks of trying to contain as much power as possible. Sapphire also adds in specific heatsinks to other components, too. If we were building an air-cooled card designed for 300W-plus TDPs, this would be close to ideal, though Sapphire does not divulge the standard power consumed by this model. One can indirectly ascertain the intentions of a manufacturer by looking at the power inputs. Sapphire goes as big as we have seen by using a trio of 8-pin connectors down the far side. That's unusual, and so is the presence of two four-pin fan connectors on the other side and front. Like Asus with its FanConnect II, Sapphire uses them to provide dedicated airflow to the card, with the fan speed controlled by graphics card's thermals measured via five onboard sensors. The rear is home to two HDMI and two DisplayPort, which is sensible, while the card-long heatsink at the back is a decent departure from the overhang of the Nitro version. The reference card clocks in at a maximum of 1,546MHz core with the 8GB of HBM2 memory humming along at 1,890MHz, thus providing meaty on-paper numbers of 12.6TFLOPS and 483GB/s, respectively. Sapphire ups this to 1,611MHz but keeps memory at the same speed, understandably because HBM2 has not shown a propensity to overclock well. A second Bios position loads a more power-optimised profile that reduces the peak speeds to 1,529MHz, and consequently lower performance. Using massive amounts of cooling is Sapphire's raison d'etre; let's now see how well this £650 beastie compares against other high-end cards.